Do you love to run? Are you training for a marathon? Or do you just like to run for fun? I love to take a run every once in a while, just to clear my head. No matter what your reasons for running are, it is a great way to stay fit and you just need a pair of running shoes. However, over time running shoes can get worn, which begs the questions of how often should you replace running shoes? There is a general rule with running shoes, which is that you should replace them between 300 and 500 miles depending on the surface that you run on, your running style and your body weight. Heavier runners will wear down the tread, cushioning and support faster than lighter runners. You should keep track of your running shoe mileage the best you can, so you know more or less when to replace your shoes. If you are finding it difficult to keep track of your running shoe mileage, then you should rather use a time frame, which can help you to determine when you need to get some new running shoes. There is a general agreement that you shouldn’t use a pair of running shoes for longer than 6 months if you run 4 days a week. If you run, for instance, 3 or 5 miles a day, 4 days a week then you will roughly put on between 300 and 500 miles every 6 months. However, if you run more than this, then you will need to replace your shoes a lot sooner and if you run less than your running shoes will last longer. Runners take different strikes, which means that your foot may hit the surface differently to another runner. If your mid or forefoot hits the ground first then you are a forefoot runner. If your outside heel hits the ground on each step first then you are a heel striker, which means wear is concentrated to an area of the shoe. You will notice this wear on the around the outside heel on the sole and you will need to replace your shoes more often. You need to keep in mind that all runners and running shoes are different and each runner needs to look at their own needs. Your decision about when to replace your running shoes shouldn’t be solely judged on the miles, but also by how the shoes are looking. If the midsole has a slant or a tilt then you should probably replace your running shoes or if they are causing new pains. If your running shoes are not causing you any problems then don’t be so quick to give them up, they may still have a few miles left in them. 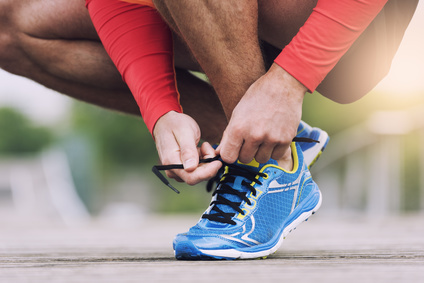 When you do replace your old running shoes, it is a good idea to first switch between the old and the new for a short while so that your body can get used to the new shoes. Try the Press Test – Press your thumb into the middle of your shoe, where the midsole is. If your midsole feels tough and doesn’t have any give then it is time for a new pair of running shoes. The midsole should feel cushy and have some give and flex. Creasing in the Sole – With your thumb, press on the outsole to the midsole to determine if the cushioning is worn out. If the midsole, before you press it, shows heavy compression lines and shows hardly any compression when you press into it then it has worn. New Aches and Pains – If you get any new aches or pains after a run then it is a sign that you need to replace your running shoes. You may find a new blister that you may have never had before, for instance. Compare – You are able to get a direct comparison when you put on an old pair of shoes followed by a new pair. You will be able to feel the difference and which one is better. If the old pair is no longer comfortable then it is time for a change. There are ways that you are able to extend the life of your running shoes, so you have to replace them less often. The first way is to actually rotate two pairs of running shoes. When you rotate pairs, the midsoles have a chance to decompress between runs and the shoe has time to dry out. When you remove your shoes, you should do it properly. It is not a good idea to use one foot to pull down on the back of the other to get them off. You should unlace each one of your shoes and take them off with your hands. Your running shoes should only be worn for running. You should have different shoes for different activities. You shouldn’t do everything in your running shoes because this will wear them a lot quicker. So, How Often Should You Replace Running Shoes? There isn’t any clear way of knowing exactly how often you should replace your running shoes, but knowing the mileage and what to look for in worn shoes will tell you a lot about when it is time to retire your old running shoes. If your running shoes are showing signs of excessive wear like worn outsoles, stretched heels or if the midsole is compressed. Remember that rotating your running shoes can prolong the life of them and you will get more running miles from your shoes. If you have any questions about running shoes then please free to comment and we will get back to you.